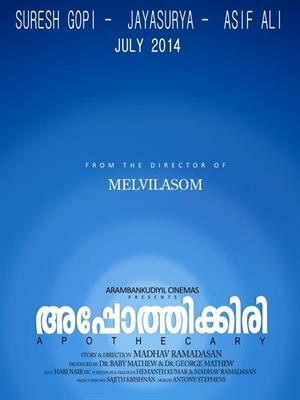 Apothecary malayalam movie to be directed by Madhav Ramadasan will have Suresh Gopi, Jayasurya and Asif Ali in the lead. The movie is being produced by Dr Baby Mathew and Dr George Mathew under the banner Arambankudiyil Cinemas. Hari Nair will stay behind the camera as the cinematographer while Sajith Krishnan is the project designer. After the final cast, the movie will start rolling from 20th February at Palakkad. After receiving critical acclaim for his maiden venture 'Melvilasom', film maker Madhav Ramadas is gearing up for his next project which will have Suresh Gopi, Jayasurya and Asif Ali in the lead. Titled 'Apothecary', this movie would be a highly technical thriller which throws light into the serious issue taking the story to the next phase. As the name suggests, 'Apothecary' refers to a health professional who is trained in the art of preparing and dispensing drugs. The movie is being produced by Dr Baby Mathew and Dr George Mathew under the banner Arambankudiyil Cinemas. Hari Nair will stay behind the camera as the cinematographer while Sajith Krishnan is the project designer. The movie will start rolling from 20th February at Palakkad and would reach theatres in July 2014. It will be a great time for young actors Jayasurya and Asif Ali teaming up with superstar Suresh Gopi which has a long experience in the industry. 'Apothecary' which revolves around an interesting theme has already raised much expectation among the movie goers. The actors are being selected based on the requirement of the character as the director is much aware about the body language and their acting potential. There will be three heroines who would have their own space in the movie. Ramadasan's maiden movie Melvilasom, an adaptation of Soorya Krishna Moorthy's stage play did have Suresh Gopi and Tamil actor Parthiban in lead. More than receiving much applause from movie enthusiasts, the movie stood unique as for its narration and socially-relevant subject. The movie which was shot inside a room was completed in just ten days. Ramadasan made name for his debut venture winning the 15th Gollapudi Srinivas National award for the 'Best Debut Director' and a couple more awards too. Along with selecting for the 16th Busan International Film Festival (BIFF), in Busan, South Korea, this movie was also been selected to the Indian Panorama section of the 42nd International Film Festival of India (IFFI).